We’ve been in our house for almost a year now. We didn’t go into it thinking we needed to build a green and efficient house … but it sure seems to have turned into that! We won’t know for a while exactly how well the energy efficiency performs because we weren’t able to start the off-peak electricity right away, and our tankless hot water heater didn’t get installed until later than expected (the gas lines weren’t run to our development until after we had officially moved in). But if it turns out to be anything like the numbers, it looks very promising! This is just an excerpt … there are plenty of numbers a person could review. But this scale was so powerful to me. 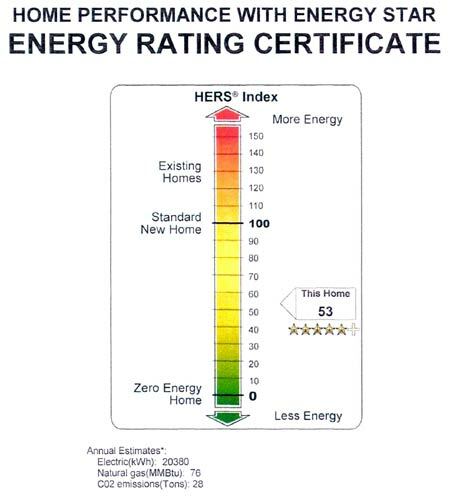 An existing home typically scores 130 on the HERS scale. A new home typically scores 100. A theoretical home that consumed absolutely no energy would score 0. Our home scored 53 … way better than a typical new home! Rumor has it that our home could be one of the most energy efficient residences in the state!